There are few times when the corridors of power open for the commoner. The Change of Guard is one such ceremony open for all which happens every Saturday inside the President House. It is held in the forecourt of the vast official grounds. I reach short of breath from running up the Raisina Hill. I can vaguely hear some announcements happening inside the palace gates. Although I was there at Raisina Hill in time, we are only allowed to walk up to the gates sharp at eight. It takes about 5 minutes to reach to the top of the hill followed by the customary security screening. I am pleasantly surprised that it is not a tedious process. There are no stringent restrictions about what you can carry inside. I see a group of foreigners with hand bags, mobiles and even photographers entering with tripods. Fortunately I didn’t miss much and it was only after everybody has settled into their seats that the Army Brass Band starts to play. The ceremony starts with sleek, muscled and well-groomed horses flanking both side of the gravel path performing in perfect unison to orders belt out by a baritone voice. 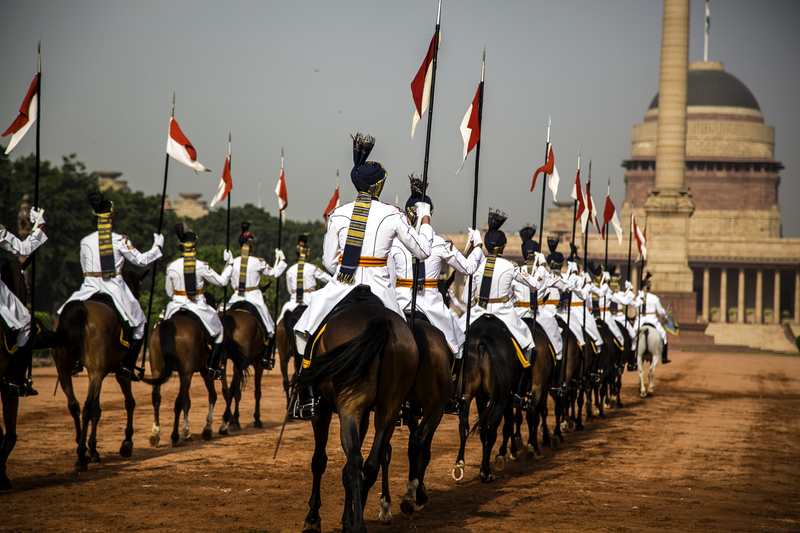 The riders – President’s Bodyguard (PBG) regiment are all taller than 6ft and are in their ceremonial regalia. The crisp white uniform and the coat of arms shimmer strikingly in the early morning sunshine. The brass band played beautiful and is not averse to a popular reworking of the traditional. The band’s playlist includes patriotic Bollywood classics. Expect all the pomp that is customarily attached to such spectacles: flashing swords, lances, ear-piercing roll-calls, bugles and much stamping on the ground. The half an hour spectacle ends with a request to the viewing audience to stand up for the National Anthem. Time seemed to have passed too quickly. Like me, the rest of the audiences hangs around for some time clicking pictures before finally starting to disperse.